Bobcats are one of the smaller species of "big cats". Habitat: Bobcats are found in North America, from southern Canada to northern Mexico. 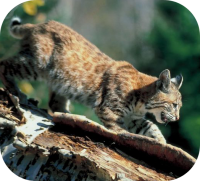 Bobcats can be found in wooded areas, semi-desert, forest edges, and swampland habitats. Bobcat Species: There are currently 12 recognized sub-species of bobcat. Size: Female bobcats are smaller than their male counterparts. 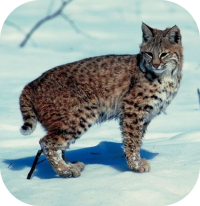 Bobcats are 18.7 to 49 inches in length and weigh 9-40 lbs. Bobcats stand 1-2 feet at their shoulders. Diet: Bobcats are opportunistic predators and feeders. 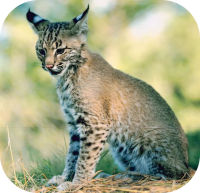 Bobcats are carnivores and will eat anything from insects and small rodents to deer, but the bobcat prefers rabbits and hares. Description: Bobcats have a bray to brown coat, whiskered face, and black-tufted ears. The coat is sometimes spotted. The bobcat is said to resembles the other species of the mid-sized Lynx. Bobcats have a stubby, "bobbed" tail, for which they are named. Bobcats have retractable claws. Behavior: Bobcats will mark their territory with claw marks and deposits of urine or feces. Birth: Bobcat kittens are born blind and weigh only about 4 to 8 ounces. Bobcat kittens will open their eyes after 10 days. 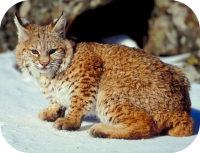 Bobcats are preyed upon by by cougars, coyotes, wolves, and owls. Gestation: Bobcats will carry their young for 60 to 70 days. Cubs: Cubs remain with the mother for the first year of their life. 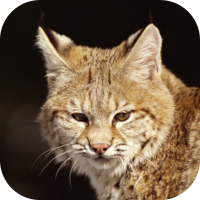 The bobcat is the most abundant wildcat in the U.S. Sexual Maturity: Bobcats are typically sexually mature and breeding by the age of 2. Life Span: Bobcats will live in the wild until the ages of 6-12 years of age. Bobcats in captivity will live as long as 25 years. 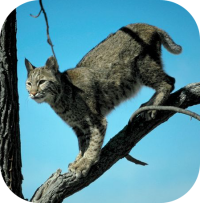 Social Structure: Bobcat are solitary but their ranges will often overlap with other bobcats. Athleticism: Bobcats are fierce hunters, they can kill prey much bigger than themselves, using a deadly pounce that can cover 10 feet in a single bound.